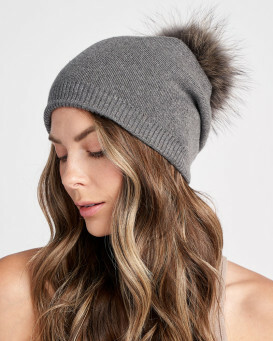 Meet your midnight majesty in a dynamic Lyric Black Slouchy Beanie with Finn Raccoon Pom Pom. The black shell is crafted with nylon and wool material for a breathable fit. 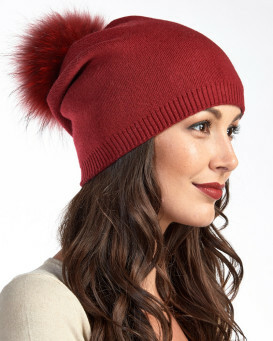 A large raccoon fur pom pom is removable for a perfect accent. The double lined design is great for a stretchy beanie to wear everywhere. The back is tacked for a slouchy effect. This one size fits all design is versatile to make a great gift for your friends and family. The contrasting design is modern to create a perfect style for young and old to wear everyday. 4.5 / 5 from 38 customer reviews. "The fur pompom hat fits great. It has an inner layer of fabric that can be pulled down for greater neck warmth or folded as an inside layer of the hat for head warmth and more visibility for head and hair. Color is a deep blue. PomPom is very large. The overall look of the hat is playful and well made." "amazing quality, fast shipping, packaged with love and care. couldn't be happier with this order; THANK YOU ?" 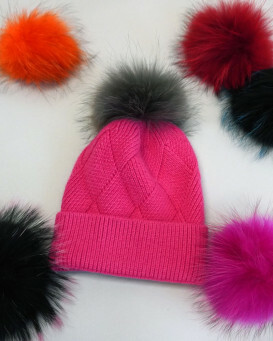 "I’m more than pleased with my purchase of the beanie hat and love the fat raccoon Pom Pom - great quality and very soft. I bought it for a birthday present but I’m thinking of buying one for myself now!" "I bought four of these beanie hats to use as Christmas gifts next December. I knew I could depend on FurHatWorld for first class quality because I've bought things before from your company. I was thrilled when they arrived to see they were even more beautiful than the pictures. 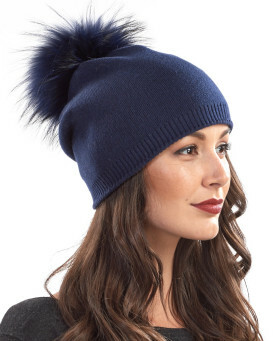 The fluffy little racoon pompoms are delightful and the beanies are soft and ever so nice. I'll be proud to give them away." "I walk to work so need something warm for the cold winter in Saskatchewan. This toque is warm and cute. Also doesn't cause static in my hair when I pull it off. One of my best winter purchases to date. Love Fur Hat World." "The black soft fabric is amazingly warm, comfortable and looks great. Make a sweater and pants in this fabric, please. Chicago Temperature today was 32 with North winds 18 MPH felt like 14 degrees. The hat is virtually windproof and kept my head and ears warm. Pom is fat and soft." "Hat is exactly as shown, knitted part is so soft and thicker than I thought it would be. Really good quality. I have an average size head and it fits perfectly. Raccoon Pom Pom is full and beautiful. Matches a collar and fur trimmed gloves I bought from this company a few years back. Love Fur Hat World!" "This hat is stunning. I've had loads of compliments. The colour is gorgeous, it sits really well on the head and it is really thick and warm. The fur trim looks fabulous as well. Really pleased with this purchase."